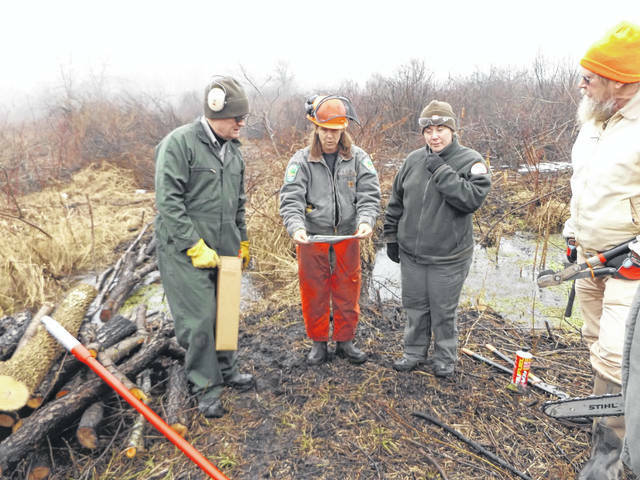 From left, Jim O’Boyle, Michelle Comer, Sarah Howard and Skip Beehler discuss their work plan to improve habitat in an overgrown fen. ST. PARIS – The Ohio Division of Natural Areas and Preserves staff and Champaign Land Preservation invite outdoor lovers to a community stewardship day at Davey Woods State Nature Preserve. Michelle Comer, West District preserve manager, will lead volunteers to remove invasive plants. All ages are welcome to join in the Feb. 16 Give Back Day project. There are jobs for people of every age. Sturdy footwear is recommended and volunteers are asked to dress for the weather, bring work gloves, lunch, water and favorite non-motorized cutting tools. Tools will also be available. Davey Woods is a 103-acre remnant of the larger older deciduous forest that covered much of Ohio. Like Davey Woods, many of Ohio’s State Nature Preserves are isolated, surrounded by land that has been changed by different types of development. As such, the preservation of these special areas, examples of the forests, bogs, prairies that once were much larger and more ecologically stable, is difficult. In order to protect them for their beauty, their history, their scientific importance and the special plants and animals, the Division of Natural Areas and Preserves has management plans for each. Nearly all of these plans include removing non-native, invasive plants and depend upon volunteers. Sign up by contacting Comer at michelle.comer@dnr.state.oh.us or 937-537-6173. The registration list will allow event planners to contact participants in case the event is cancelled due to inclement weather. Directions: Meet in the Davey Woods parking lot at 9 a.m. Saturday, Feb. 16. From Urbana, take U.S. Route 36 west to Neal Road, turn north and go about one mile, then turn west onto Smith Road. Follow Smith to Lonesome Road and turn north onto Lonesome. Davey Woods will be on the left. Follow Lonesome Road a short distance. The parking lot is on the left/west side of the road. Ohio Department of Natural Resource’ Division of Natural Areas and Preserves protects significant habitats such as bogs, prairies, old growth forests, endangered species and rare geologic formations. These special places are open for the enjoyment of all. The conservation of land for agricultural production, natural habitats and open spaces preserves the spirit of Champaign County and its values for future generations. Submitted by Champaign Land Preservation.